Richie Noparstak playing offense against North. 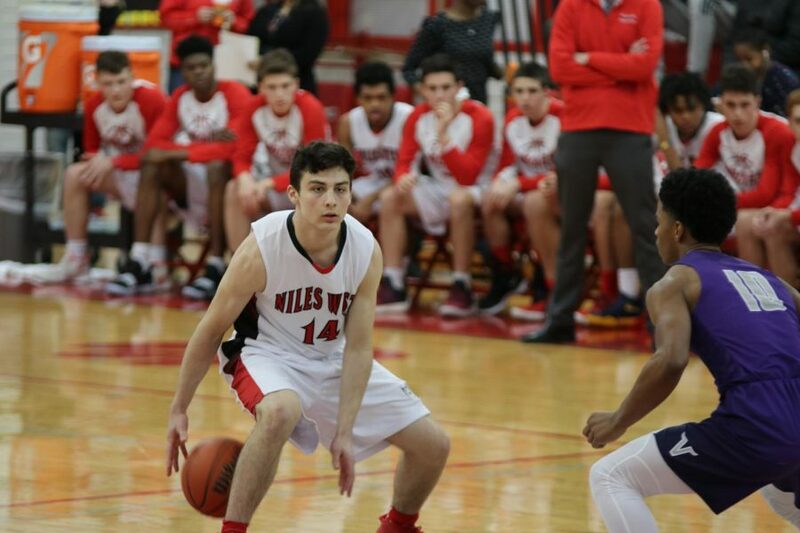 The Niles West boys varsity basketball team lost their game Fri. Jan. 18 to their rivals, the Niles North Vikings, after a close match that had the crowd on the edge of their seats. With the game ending 53-56, fans and teammates alike felt the upset of the loss. Though tough fights were being put up by both opponents, the Vikings ended up taking the win and kept the traveling trophy. Head Coach Mike Wasielewski evaluated his team’s performance after the game and analyzed their setbacks and triumphs they had experienced during the match. “I think we had one of the worst starts of the year… but I was proud of how they crawled back into the game,” Coach Wasielewski said. The Wolves had a rocky start to the game, with the first quarter ending 7-19, but they were able to get back up to speed and reduce the deficit to 25-31 going into halftime. Though they were down a few points, the boys kept playing strong and ended up finishing the third quarter off 39-47. 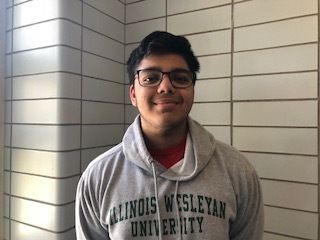 As the fourth quarter progressed, the team managed to keep racking up points and get closer to a tie game, but they ultimately couldn’t pull ahead as the game ended 53-56 for Niles North. Junior Adnan Seferovic can attest to his team’s efforts during the match. “I think we started off a little slow, but in the second half, we beat them. It wasn’t enough in the end, but we came close,” Seferovic said. Though this game didn’t end how they would have liked, the boys have high hopes for the rest of the season and are proud of the work that they have already accomplished. Senior Kevin Guillaume gave some insight on what can be expected as the season continues. “We hope to grow and develop more as a team while learning from our mistakes,” Guillaume said. With this positive mindset, the wolves have a promising season ahead of them as well as a lot to look forward to as the year progresses. The teams next game is Tues. Jan. 29 at Niles West beginning at 6:30 P.M., where they will play Maine West.